A short addition for this project.. The part where I get to do a quick field test rating for my workmanship! Mmm yes, back to the drawing board. Whilst attaching the locking clip pictured above, I had to change its position once. This left extra holes in the particle board which in turn weakened it up. 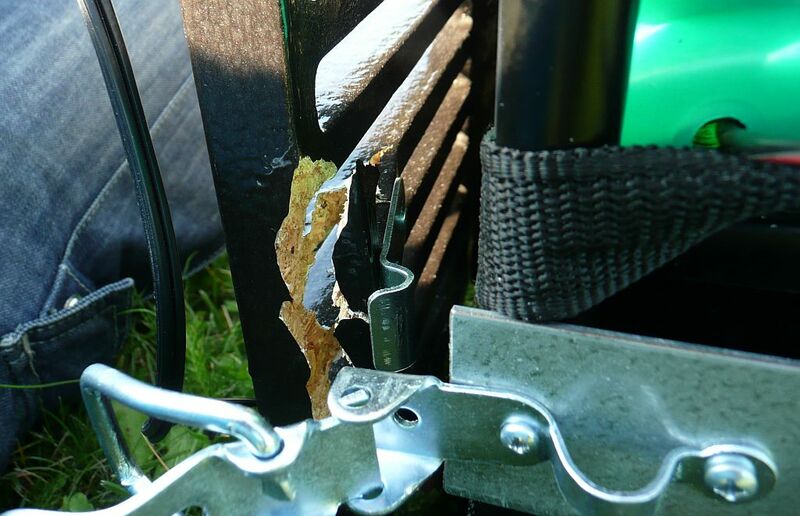 No wonder, that once out in the open and hitting a _serious_ bump with the trolley, the board fractured. Reckon I’ll revise the location of the locking clips a little and then proceed with testing. 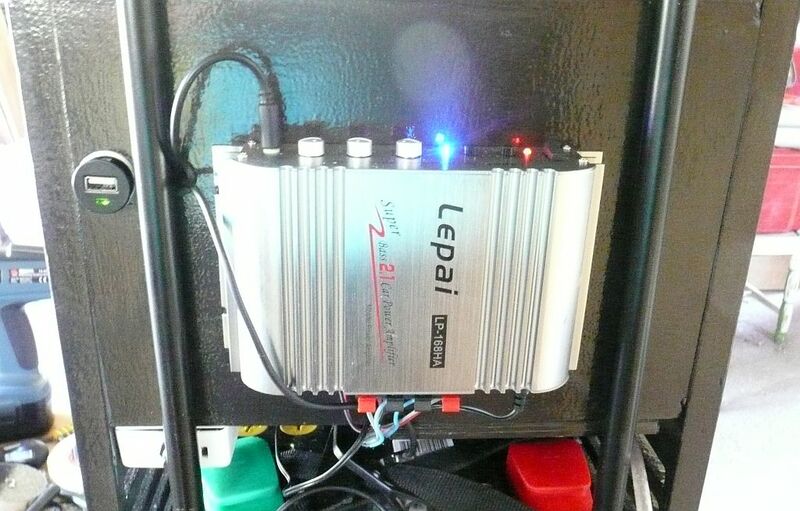 Amp all wired up, USB power adapter installed to cigarette lighter socket. Uh, where to begin..? Certainly been lazy with any updates, but quite the opposite with building this ‘thing’ :). Lots of small issues sorted out, plenty of adapting on the fly as well as some amount of re-do, all (finally!) 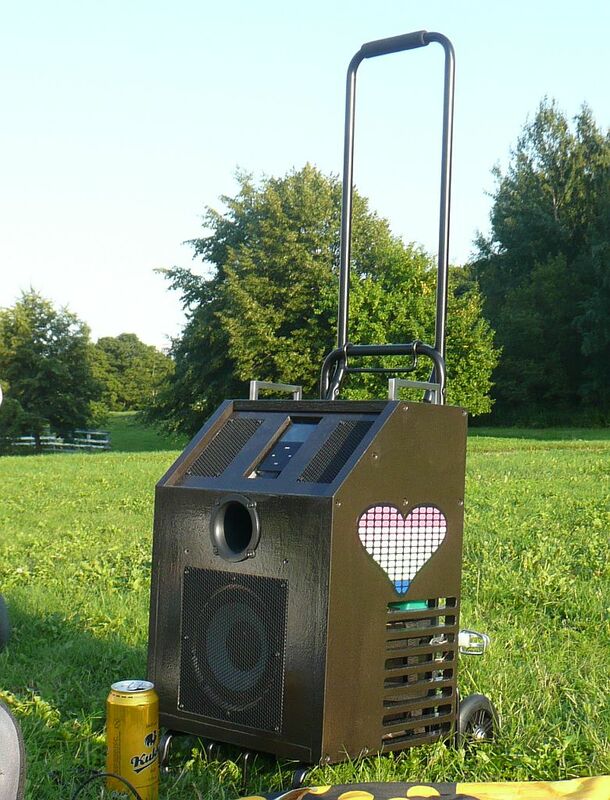 mounting up to a point where the Boombox actually started making noise! I sure can’t recall the details of even half of all the work I’ve put in, but picking things up from last time, let’s start with the analyzers. I ended up adding a separate 3.3V switch mode DC/DC converter board for them and housing everything inside a small junction box. The analyzer boards used a 10k linear potentiometer for sensitivity adjustment and thus, wiring both to a single stereo potentiometer seemed like a good idea. Too bad I had only a logarithmic potentiometer at hand so as it is for the time being, the adjustment is a bit tricky. Will replace this once I have the proper part. 6″ compartments are shaping up neat. Two layers of paint have been applied, so what little remains to be done is mainly the wiring chores. I’ll wait with this until I have the treble compartment ready to be wired up too. As a neat little extra detail for cabling through-holes, I now have some rubber grommets. These were sourced from the Panasonic speaker enclosures, where they were used to attach the decorative fabric in front of the speaker. 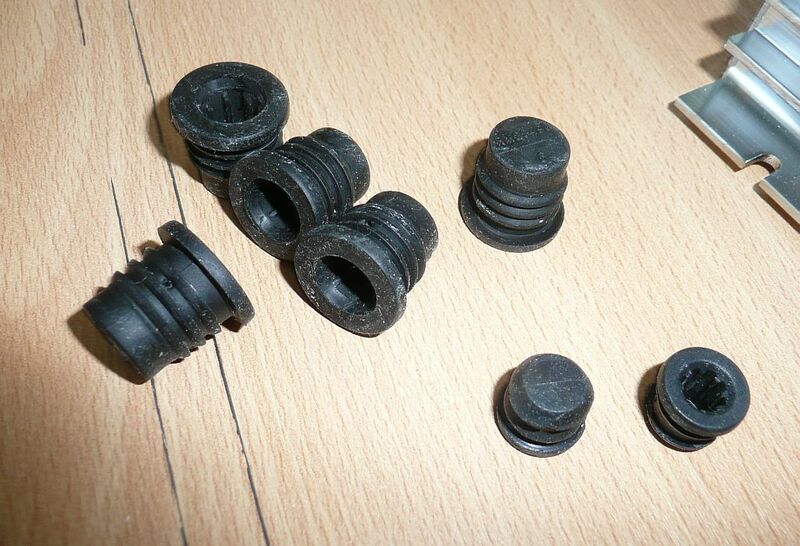 Rubber grommets, just loaded with high re-use value! With the sheet pieces cut, this project is now moving swiftly towards assembly! At the moment, there’s still a bit of CNC pending as I need to wait for some parts to arrive. 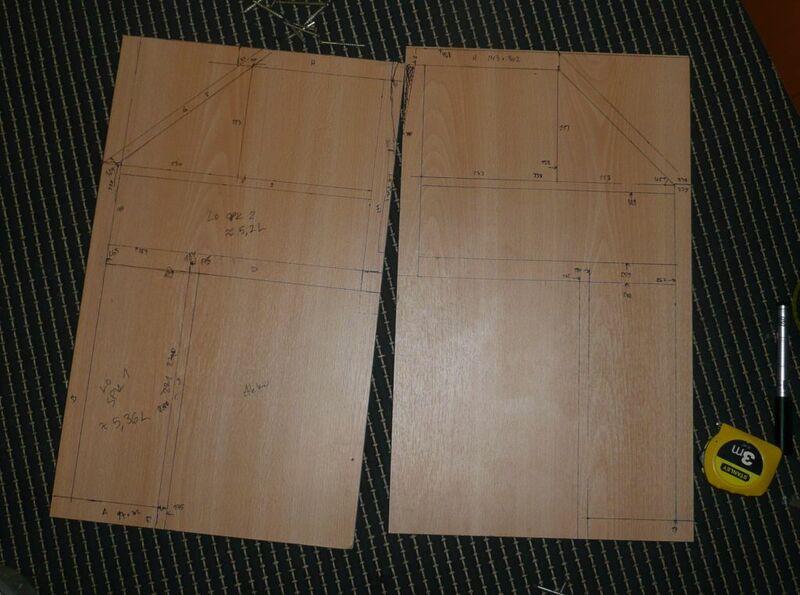 The final structural layout on the right side panel, left still has the old one. Whilst doing the sheets, I also decided to cut a bunch of 9x9mm sticks. Their planned use is to make the top sheet assembly of the upper 6″ speaker compartment stronger. But, should the need arise I can use the extras as assembly supports elsewhere inside the enclosure.